Aspose.Pdf for Cloud is a REST API for creating and editing PDF files. It can also be used to convert PDF files to different formats like DOC, HTML, XPS, TIFF and many more. Aspose.Pdf for Cloud gives you control: create PDFs from scratch or from HTML, XML, template, database, XPS or an image. Render PDFs to image formats such as JPEG, PNG, GIF, BMP, TIFF and many others. Aspose.Pdf for Cloud allows you to create new PDF files from scratch. You can create a new PDF file in PDF, PDF/A, PDF/A-1a, or PDF/A-1b formats from scratch. You can also create a new PDF file from an existing HTML or XML file. Aspose.Pdf for Cloud also allows you to generate a new PDF from a text file. It is also feasible by using this component that you can generate PDF files using a template. You can fill in data into this template from a database or from some other resource and create output PDF files. PDF file is a portable format which can be used on a variety of platforms. However, some times, due to certain business requirements you need to convert the PDF file into other formats. For example, you may convert a PDF to HTML and publish on the web or you can convert a PDF file to images and add those images on a presentation etc. Similarly, a business may require a PDF file in a specific PDF format like PDF/A-1a or PDF/A-1b etc. In such situations, you need to convert PDF file to other formats. Aspose.Pdf for Cloud allows you to convert a PDF file into a variety of formats. It can help you with these conversions with the help of a simple REST API method. Aspose.Pdf for Cloud allows you to manage multiple PDF files and PDF pages. You can merge multiple PDF files into a single file. You can also split a PDF file into multiple PDF files. You can insert one PDF file into another PDF file. Similarly, you can work with PDF pages as well. You can insert a blank page in a PDF file. you can take a page from one PDF and insert it into another PDF file. This API also allows you to split a PDF file into individual pages. Aspose.Pdf for Cloud also helps you move PDF pages from one location to another within a PDF file. You can also delete the pages from PDF file. Aspose.Pdf for Cloud REST API helps you secure your PDF file using different methods. You can encrypt a PDF file using an algorithm. This API allows you to set owner and user passwords to protect the PDF file. You can also apply different permissions on the PDF file. Aspose.Pdf for Cloud also allows you to sign a PDF file using a signature. If required, you can reset passwords or permissions. You can also remove the signatures and decrypt the PDF file as well. Aspose.Pdf for Cloud provides you all the features you need to handle text in a PDF file. A large part of most of the PDF files is text. In order to work with PDF files, you need to manipulate text in many different ways. Aspose.Pdf for Cloud REST API, allows you to find and replace text, remove text from the PDF file, replace text using a regular expression etc. It also helps you in extracting text from the PDF. You can either extract all the text from the whole PDF or a particular page. Aspose.Pdf for Cloud also allows you to extract individual fragments, segments, or text items from the file. You can retrieve text formatting information as well using this API. Your application might need to work with images as well while working with PDF files. You can add images in the PDF file, replace an existing image, and remove an image from the PDF file with the help of Aspose.Pdf for Cloud. This API also allows you to convert a PDF page to different image formats like JPEG, PNG, GIF etc. It also helps you convert the whole PDF file to a single multi-page TIFF image. You can also convert the images to a PDF file. Aspose.Pdf for Cloud also provides you the functionality to extract images from the PDF file. Most of the time a PDF file also contains different types of forms. These forms are built using different form fields. Each form field is used to get a different type of information and save in the PDF file. These form fields include text field, dropdown, checkbox, radio button, submit button etc. Aspose.Pdf for Cloud helps you extract PDF form fields. 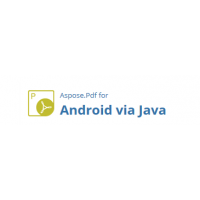 A complete document formatting implementation for Android.Aspose.Words for Android via Java is an ad..